Vegetarian Starters There are 6 products to choose from. Takeaway Lanzarote - Restaurants Playa Blanca Spicy crispy fryum topped with chopped, onions, tomatoes and spices. Takeaway Lanzarote - Restaurants Playa Blanca 2 pcs of triangle shaped deep fried pastries filled with savory potatoes and peas. 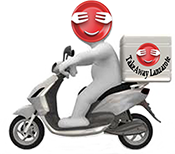 Takeaway Lanzarote - Restaurants Playa Blanca Shredded onions crumbled with herbs and spices coated with gram flour deep fried. Takeaway Lanzarote - Restaurants Playa Blanca A plater of deep fried sliced vegetables, dipped in gram flour batter. Takeaway Lanzarote - Restaurants Playa Blanca Sliced Cottage cheese coated with herbs, gram flour batter deep fried.